An XML created with the help of an XML markup language and are especially intended for search engines. You can create and submit your site's XML sitemap in webmaster tools, which will not only improve your site's crawling rate but also quick indexation of your site. On the other hand, HTML sitemaps are created with plain Hyperlink Text Markup Language and are especially intended for your website visitors. It is usually used to list all the post or pages that are published on your site. You can check the demo of this widget here. Once everything is done, press Save Template button present at the very top of your screen. After pasting the above code, you can write a title of your page. If you wish you can also disable comments because you would not like people posting comments on your sitemap. Once everything is done, press Publish button. 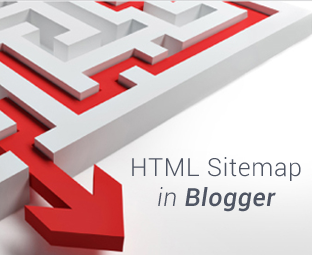 We hope this article helped you learn how to add an HTML sitemap page in Blogger. If you enjoyed this article please share your thoughts in comments section below. This is the cleanest good looking sitemap I've ever seen. 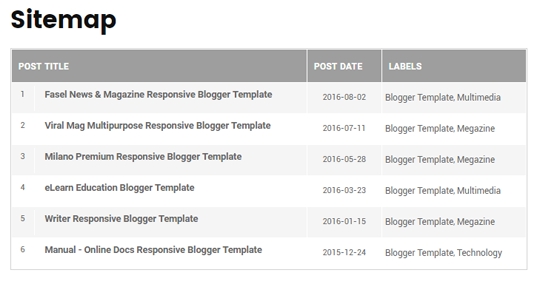 Good job MyBloggerLab! From Above I mean over. how to change the table header (i.e. post title, post date, labels)? And why the sitemap doesn't show "NEW" in new post? Great Thanks! This has Worked on my website. Really helpful, thanks a bunch! Hi admin how i create sitemap of categories ? Stay tuned, we will soon write a tutorial on it. Love this one! Thank you. All others I've seen use labels instead of posts. I don't suppose though that there could be a way to list the blog posts, 'alphabetically'? JS links are not considered as backlinks in terms of SEO. Nor It will be going to slow down your site. If you want to use the JS codes you can simply paste it in your template the load time will be same before/after.